Moving house is a tiresome affair at the best of times, but takes a whole new level of energy when you are basically something of a geek. When you have a room converted into a studio and most rooms in your house or apartment contain at least some element of gadgetry spilling out with a mess of chargers, documentation, manuals or interfaces then you probably don’t want to move often. Or at all. Much like learning the tooth fairy is not real (sorry) or realising that Sony has nothing but contempt for its customers (blackhat) it is an inevitability. It will happen. 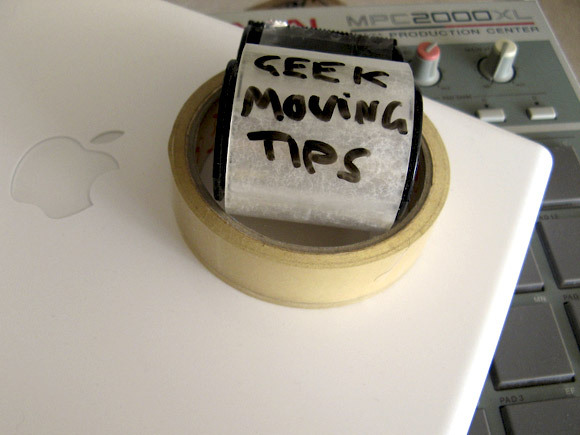 When it does, consider some of these tips that I have found useful in my own recent moving. Keep boxes for your studio visual monitors – such as LCD screens – and your studio audio monitors – such as reference speakers. For sake of shipping for repairs or warranty claims, and given their delicacy, it pays to keep the boxes for your studio monitor speakers in any case. This stuff is the most difficult to do without should something happen to it, so more than most other items you should consider packing down and storing these boxes where possible. Plastic storage containers are much better then cardboard boxes for cables and electronic gear that might be affected by moisture and dust, or require some greater protection from clumsy handling. With the clip-on lids it only takes a small band of packing tape over the handles to secure, and they can be stacked for storage afterward. If they are unpacked after the move, they fit neatly enough inside each other for storage, and are always useful for shepherding gear around where sherpas are rare. If you are like me you will have packed the bedroom, bathrooms, kitchen and lounge room well before you will even have moved one item from the studio or studio space. There are always so many projects to work on, so many great sites to read, and so much internet to download. You are addicted to being awesome. Go cold turkey. Pull the power to your computers, unplug the studio monitors, turn the modem/router off and disengage. Commit to the move and the hunger to get precious interwebz and megahurtz again will motivate you to hurry up and finish the process! Any moving tips and hints document I have read lately has recommended making an overnight bag of the clothes, work items and documents you will need. The same should be said for your geek lifestyle. If you have user names and passwords you haven’t memorised, then copy those down somewhere portable and secure. Just as importantly, get yourself geeked up in a way that will keep you productive. Once you accept the downtime of moving house, you can work out what you can do instead of staring blankly at the walls. Even if that just means playing Sudoku on a Nintedo DS. A lot. This is a great chance to look at the box you haven’t opened in the last 4 years, yet you have lugged between houses multiple times. Have you ever used those old XLR cables? Are you EVER going to use that Behringer patch bay? Are you really going to circuit bend that Casio? Does that soldering iron even have a power supply? Take stock of this stuff and be merciless. Whilst the golden rule of music production hardware is cited as “sell nothing”, there is much to be said for clearing out clutter and freeing up your workspace and storage space. I shouldn’t even have to say this, but this is a time back your data up. Back your data up even from the back-ups and back those up. Maybe not that far, but I’m simply stressing the need to back-up. By saying “back-up” a lot. More then likely somewhere around your geek desk is a pile of CD-R’s and DVD-R’s. You probably have an external drive with data backed-up on it that has some “temporary” back-ups of stuff you mean to “file and sort later”. The time is now. The golden rule here is to consider this your ultimate deadline to have healthier filing and back-ups. Consider purchasing (if you haven’t already) a disc filing case. Consider committing to a simple but effective back up system once you have moved, which takes the pressure of the backup you need to do now. The chances of something being dropped, stolen or otherwise affected in the move are very real, and anything you can do to prepare for this will make your life easier. This is a strange point, but one worth mentioning. Despite my adventures, I struggle to let go of my ergonomic and tweaked studio space each time I have to move. This makes less sense looking back over each move, and realizing I have had a significantly better studio experience each time, going from the “in the bedroom” setup in a share house, through to custom furniture in a converted and dedicated room. In between however, I have made makeshift studios by pushing trinkets off of cluttered tables in short lease corporate apartments, almost entirely re-arranged hotel rooms, and even selfishly dominated entire bench tables in rowdy European backpacker hostels. Beer stained optical mouse and all. Some of my band’s best tunes (and most of the worst) have germinated in some of these challenging and inspiring places. The average studio setup has a lot of gear that I call “back seat” gear. Those things with knobs and faders and LED’s that don’t lend themselves to being thrown in a box with other stuff and would better be put on the back seat of the car. This can include computer monitors, but you have hopefully kept the boxes for those. For synthesisers, mixers, effects units, grooveboxes, drum machines, VJ gear, midi controllers and similar, it quickly becomes evident that a lot of foam and more boxes than one would have anticipated are necessary. People who aren’t geeks or creative types won’t get this. They will look at the studio like a kitchen or bathroom and presume you can just throw it all in a box and be done with. These are the people you make carry the heavy boxes. The obvious point here worth repeating is to have more boxes than you think you need, and as much foam, bubble wrap or blankets as possible. A lesson learnt the hard way. There is a chance that you will be utilizing the assistance of someone – or some people – who have offered, for some strange reason, to help you to move. There is a chance that they will not be from the same mindset as you. For example: Where you see a sought after vintage analogue synthesiser, they probably see a battered old keyboard. Where you see a Torrent box, they might see an amusing old Pentium III housed in a sun discolored case. Where you see an Important Thing in a Logical Temporary Space, they might see some clutter that’s getting in the way. Be kind to them and be patient. They are after all helping you. If you can’t make music, play WoW, edit video, write code or design during the move, and the idea of being constrained to wherever your laptop ends up doesn’t appeal greatly, then consider the time as a holiday to test some alternatives. If you have a PSP or a DS and the appropriate OS modifications then try some homebrew applications like PSP Rhythm or Protein DS Scratch. If you have been curious about Linux or alternatives to Windows, why not try an install? If you have web access you could waste hours on ffffound or playing with online 303 emulators under the pretence of inspirational immersion. Once you feel guilty for that time wasting, you could go to the library and get out books on programming or music theory or photography, and consider a life where everything is on loan and you never have to box or move a single possession again. Consider moving in to the library itself. Plot where you might build a little fort for entertainment and, well, defense. And then it’s time to unpack. Inter-App Video: A Mac GPU Hack, More Ideas?